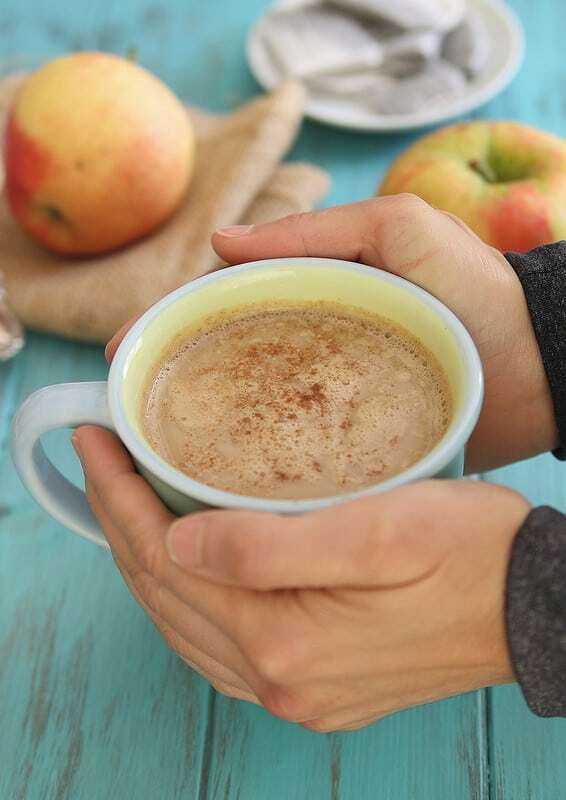 This apple cinnamon tea latte is the perfect warm fall drink to cozy up with. There are two kinds of nights for me lately. One involves a nice big red wine glass and polishing off as much of the 6 bottles stashed in one of my bottom kitchen cabinets as possible without waking up with a hangover. It’s a fine line but no sense in packing and moving wine bottles, right? 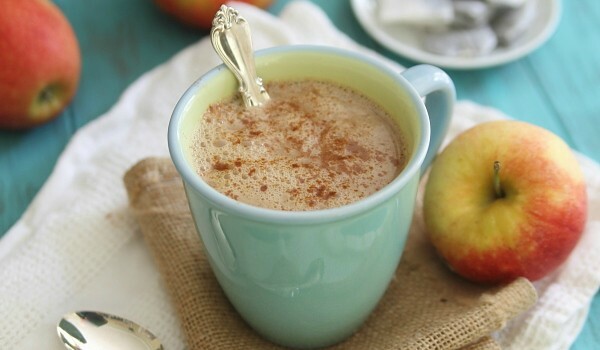 The other entails my favorite teal mug filled with this apple cinnamon tea latte. It’s my at home version of an overpriced Starbucks fall drink (which for the record, I haven’t had even one this year) and it usually comes with a side of Scandal on Netflix, sweats and a big fleece blanket. So Saturday night in an attempt to enjoy my weekend while Ulysses was working, I balled up old junk mail in the fireplace, placed a few logs on top and lit the paper to get a fire going while I started simmering the milk and cinnamon for this with a new episode of Scandal waiting for me on tv. I noticed a slight smoke smell while I was behind the stove (just out of sight of the fireplace) and thought “hmm, that’s weird” but continued on. Then just as the tea pot started to whistle, the smoke detector starts going off. Ginger starts howling and I almost burn my hand from the steam coming out of the tea pot trying to turn the burner off. I look into the family room and it’s filled with smoke, tons of it just pouring out of the fireplace and slowly spreading throughout the house. At this point, the fire is blazing and I still don’t understand what the heck is going on because this has never happened before. And then it hits me. The gung-ho radon inspector who was here a couple of weeks ago shut the flue when he set the system up (as if that would really make a difference in a radon reading) and we hadn’t used the fireplace since. So now I’m staring at the fireplace trying to figure out how to get my hand in there with a fire blazing below it to open the flue. I try using the lighter, then an extra piece of wood unsuccessfully before realizing it’s just not going to work and I need to put the fire out. So I fill up a bowl with water and then dump it in the fireplace. Water gets everywhere on hearth, the fire sizzles, I reach up to open the flue without thinking that duh, the metal latch is going to be hot after a fire was burning below it and burn my hand as I pull it open. At this point, Ginger is hiding under the table, I’m now running around the house waving pillows in the air below the smoke detectors to get them to shut up and opening all the windows to get some fresh air in the house when I realize I left the milk simmering on the stove for the latte. I run back into the kitchen to find a burned milk mess in a sauce pot. And that’s when Saturday night went from a tea latte night to a wine night. Only, I wasn’t successful in waking up on Sunday without a hangover. Bring the cinnamon, milk and honey to a simmer in a small sauce pan over medium heat. In a blender, combine the brewed tea and the apple. Pour the tea and apple mixture into 2 mugs and top with the milk mixture from the sauce pan. “It’s a fine line but no sense in packing and moving wine bottles, right?” Moving from Washington to Florida…this is totally me right now! Love it…and I love this tea latte even more! Perfect for a cold morning, afternoon, night…whenever! I see it as totally rational to drink it versus move it. I mean, moving is a lot of effort – why make it harder on yourself? Drink up! What a mess!! Hopefully the mess and your hand weren’t too bad! Yes it definitely needed to be changed to wine night or you should have gone to HARD liquor. I can picture all of this happening like in a movie. 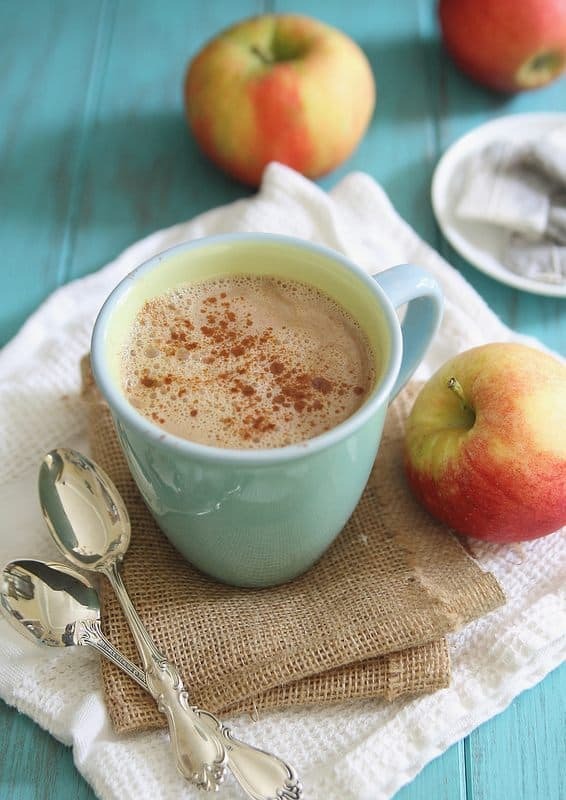 At least this apple cinnamon tea latte looks refreshing. haha, yes I totally felt like I was in a bad, bad comedy! Gosh this is just what I’ve been wanting! I don’t like coffee, but I always want something fall like and comforting. I think this’ll do the trick! I tried to use regular whole milk and it curdled, Anyone else try it or have this problem? that’s why the recipe says almond milk. OK thank you! i guess ill have to go get almond milk!! Omg, Gina, your stories crack me up. I can honestly picture you running around the house with a pillow and being all frantic. That would probably be me too so we’re of kindred spirits, my friend. I hope your hand is ok after grabbing the metal latch! Ouch! This tea latte looks PERFECT for a cold night. Has all my fav flavors in it! This is the perfect recipe for fall – and im sure it smells/tastes/feels like it too! Also, a nice break from all the baked fall goods :) Very creative! Gina this is genius! I’ll be adapting this for the 21dsd and I know it will make the perfect treat. My children are totally rubbernecking me at this recipe..gonna have to make it. Reminds me of fall and fall is my fave.